MDC-Alliance is now in a quandary on how to proceed with its electoral reform demands after its push for a sadc Extra Ordinary Summit over the electoral situation in Zimbabwe failed to get takers in the region, The Herald can reveal. In its briefings with election observers in the country, it emerged that the alliance’s principals were not speaking with one voice on the so-called reforms. The Herald is also reliably informed that after failing to get joy from sadc, the MDC-Alliance is now desperately trying to mobilise other contesting parties under the multi-party liaison committee to confront the Zimbabwe Electoral Commission. The parties, however, shut the door on the formation, arguing that by rushing to sadc, the MDC-Alliance undermined them. 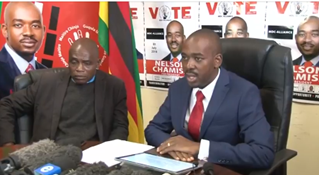 This comes at a time when the alliance is divided on whether to boycott the elections or not and in a show of confusion in its ranks, two days ago, its leader Mr Nelson Chamisa said he had whittled down his list of demands from 11 to just two. With regards to the alliance’s regional diplomatic offensive, their petition found clear passage into the dustbin in some countries that viewed it as mere political grandstanding by a party afraid of elections. The Herald established that the MDC-Alliance sent communication to the sadc chairman President Cyril Ramaphosa of South Africa, chairperson of the Organ on Politics, Defence and Security President João Lourenço of Angola and vice-chairman of the organ President Hage Geingob of Namibia, begging for an Extra Ordinary Summit on the electoral situation in Zimbabwe, which they described as a “crisis”. This idea was inspired by what happened in Maputo in 2013, when the regional body convened a meeting on Zimbabwe before the polls held that year. Diplomatic sources that spoke to The Herald last night said: “The whole petition was ill-conceived considering that sadc’s own observer mission is already in the country, favouring it with updates on the electoral situation in the country. “It would have had made sense before the deployment. Now that the sadc team is in situ, it cannot rely on a contestant for its own appreciation of the electoral environment obtaining in the country. Another source said this was primarily so because some of the countries have had similar unhappy experiences with their opposition parties who were unnecessarily fussy. Another regional diplomatic source said: “MDC-Alliance has been interacting with different observer missions, including African observers and the surprising thing is that its own officials are not speaking with one voice. “A good number of them have admitted that the issue of ballot paper and ballot printing is already water under the bridge and thus accepting the ZEC position. “What they are looking for at this stage are concessions around the transportation of the ballot papers. The Herald sought a comment from Secretary for Information, Media and Broadcasting Services Mr George Charamba on whether or not the military was going to be involved in the movement of ballot papers. “Historically, we have tended to hold elections during the rainy season when some areas are not impassable like some areas in places like Gokwe, thereby necessitating the use of Air Force of Zimbabwe,” he said. “This time around, elections are happening well after the rainy season, making it unnecessary for the involvement of the Zimbabwe Defence Forces.